Rusal-world’s largest aluminum company foresees sharp jump in aluminum premiums during the coming quarters of the year. The company forecasts supply deficit for aluminum market owing to large scale production cuts by Chinese producers. 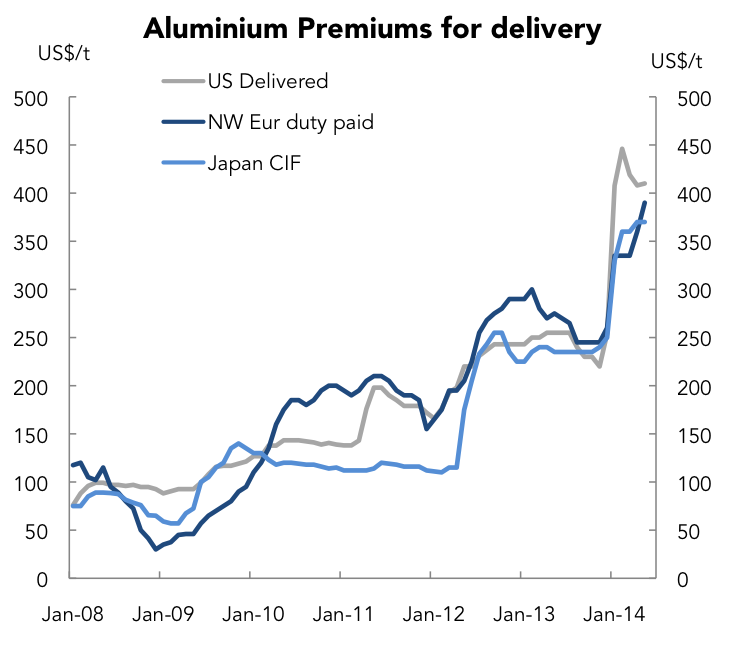 The tight supply situation may push the aluminum premiums to new record highs during 2014, Rusal noted. According to Oleg Mukhamedshin, Deputy CEO, Rusal, Chinese aluminium makers are likely to cut 3.5 million tonnes of aluminum smelter capacity this year, which can possibly lead to shortage of the metal in international market. The premiums that are currently around $400 may spike by 50% to $600 towards third quarter of the year. The Indonesian ban on export of unprocessed ore may weigh on Chinese mills. The domestic bauxite prices have surged higher by $20 to reach $70-$85 since the start of the year. The higher raw material costs may force many aluminum producers to idle capacities. The country has already cut 2.1 million tonnes of production capacities so far this year. Rusal expects further cut of 1.3 million tonnes before year end. Sources indicate that millions of tonnes of aluminum inventories are tied as backlogs with LME warehouses. Rusal had won a court order against cutting queues to 50 days. Mr. Mukhamedshin declined to comment on LME moves to appeal against the court ruling.